This past Monday, Kingsbury Hall, at the U of U campus was sold out and filled with sweater-wearing brooding emo students who make it a point to wear thick glasses and/or tight jeans. I was there as well. But don't worry, I wasn't wearing tight fitting jeans. They don't look very good on me. Sufjan Stevens, who has a cult following who see him as a folk-indie hero, came to town for the first time in years to tour to celebrate the October release of his latest cd, The Age of Adz. His last full length cd, "Illinoise" was released in 2005. As a fan who has his back catalog I felt a little neglected that such a talented musician would stay off the "scene" for years without any word of new material. I was one of the naive fans who believed he would complete his quixotical quest of releasing an album for each state. Obviously that wasn't going to happen and he came out and acknowleged that as well. Even though he fell in my artist rankings, I had always wanted to see him in concert. Then with the release of his new cd, he announced a concert stop in Salt Lake City. It was $40 each ticket. (Which apparently doubles if you decide to bring your wife.) There are many shows I have turned down that have charged less, but I knew I would regret it had I not gone. The show began as Sufjan and his band of 10 were sillhouetted by a screen in front of the stage. 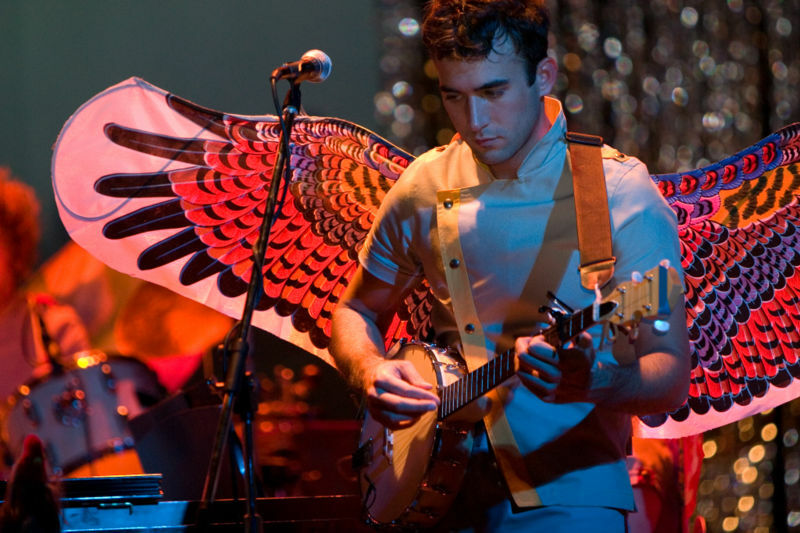 Sufjan plucked the banjo perfectly to an earlier track "Seven Swans." He already had the audience in his hand with the haunting melody rife with christian overtones. There are many concerts I attend (i.e. Muse) where the band hasn't talked to the audience much. They just give you straight-up rock and roll. That was not the case with Sufjan at all. In between every song, he would introduce the next song with his awkward-skinny-white-guy humor. As with his music, everything was intentional, whether it was his trippy yet ridiculous talk of the cosmos, or his 10 minute story of the deceased Southern painter Royal Robertson. I could tell a large section of the crowd was getting restless during the story, but I just let it soak in. It wasn't your typical concert. It was more like "An evening with Sufjan Stevens." Much of it would easily fit on VH1's storytellers. Stevens took several risks during the set. After playing only one old song, he played only new material from his recent cd and LP. Fans that were coming solely to hear his classics from "Illinoise" would have been greatly disappointed. Another risk is his decision to play the new cd's last track "Impossible Soul" which clocks in at 25 minutes. Not only did he play the entire thing, he streched it out to 40 minutes. You'd think everyone would be fidgeting in their seats, but just the opposite transpired. The crowd, who were seated for all other songs, got on their feet and joined in the Sufjan Stevens dance party. (Those are 4 words I thought I'd never say about the folk artist) Sufjan, who was wearing wings and a lit-up visor was complimented by his band who were apparently still wearing their halloween costumes from the day before. Sufjan confidently danced on stage but his "moves" were very white. (He and I might have gone to the same dance school) But as with his monologues and music, it was all very intentional. Another welcome addition to the show was the large screen displaying utopian sci-fi art from Royal Robertson, this kept in theme with the techno-synthesizer feel of the concert. The songs that highlighted the show were "I Walked" "Get Real, Get Right" and "Vesuvius." The vibe from the cd was completely different from his earlier work. He went from haunting banjo and upbeat piano songs to bombastic instrumentals that sound like they escaped from a Flaming Lips recording session. Though the lyrics and voice are 100% Sufjan. Without sounding gay, I have often compared his voice to the smoothness of honey. Just give him a listen and see if you disagree with me. He did satiate the crowds' appetite by playing his most well-known hit "Chicago." I love the song and I'm glad he played what at least half of the audience were anticipating but it felt out of place in a show filled with new material. Sufjan thanked the audience several times for giving him the opportunity to play mostly new material and giving him the chance to get it all off his chest. The obligatory encore was the cherry on top as he played a few older gems, finally ending the night with the haunting (how many times have I used that word in this review?) track titled "John Wayne Gacy Jr." For an extremely vibrant show it started and ended on very mellow tones. This was like no other concert I have been to. It was what artists should perform, an experience that is entirely unique and isn't just a retread of how the cd sounds live. That said, it left no room for fence-sitters. I know people that hated it and others that loved it. I agree with the latter and will see him again in 5 years. 5 stars! great job man. You had very similar feelings about the show as I did. Let's just hope it only takes him a year or two to get back to Salt Lake instead of five!